Magnificent south facing chalet-apartment (128m2) located in the quiet area of the Salle les Alpes 1400 village, known as Serre Chevalier 1400. The apartment is near the shops and commodities meaning you won't need your car during your holiday, a free public car park is 50 meters away. The ski lifts at Aravet are a 3 minute walk (250 meters). The ski rental shops offer ski lockers at the foot of the slopes. 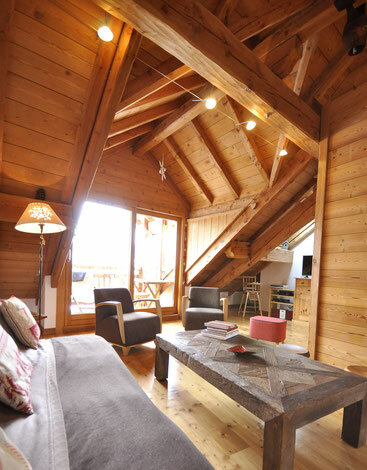 This chalet-apartment is located on the top floor with only one flight of stairs to reach it. All of the six rooms along with two south facing balconies are on the same level. Household and bed linen is provided. A detailed clean is carried out after your departure. 5 bedrooms, 3 bathrooms (1 bath, 2 showers), 3 WC and a utility room (washing machine & tumble dryer) comfortably accommodating 10 - 12 people. It has been recently renovated respecting a traditional architecture using larch wood for beams, cupboards and flooring. This stylish apartment ticks all the boxes for a comfortable stay, perfect for a holiday amongst family or friends. The apartment is available to rent from Sunday to Sunday. Spacious main room : lounge, dining area, fully equipped kitchen and south facing balcony. 1 double bedroom (160 cm bed) with private bathroom, wc and south facing balcony. 1 double bedroom (160 cm bed). 1 double bedroom (140 cm bed). 1 twin bedroom (two 90 cm beds). 1 quadruple bedroom (bunkbeds and two 90 cm beds). Each bedroom has a large wooden (larch) wardrobe. 2 bathrooms (shower, washbasin and wc). I-phone/I-pod base with Marshall speakers. Cot, push-chair (buggy) and high chair available upon demand.